Following on from the success of the SPREE festival, Voices in Paisley, offers a short programme of exciting concerts and recitals for 2012. 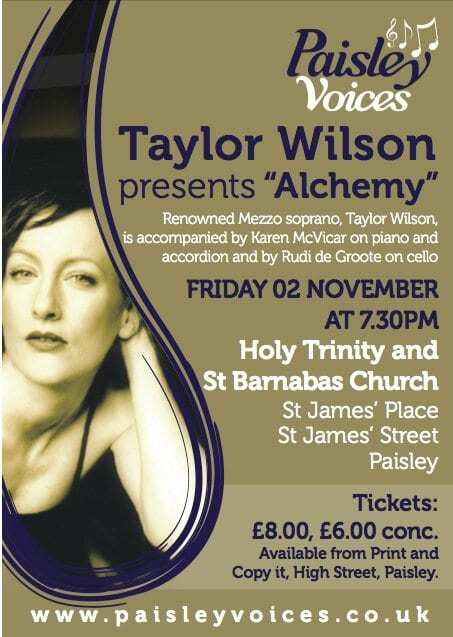 The Paisley Voices festival welcomes Mezzo soprano, Taylor Wilson, for a concert of songs from all over the world entitled ‘Alchemy’. The multi-lingual vocalist has recently returned from a tour in Hong Kong and a University series around Scotland. She is famed for her rich tone and dramatic story-telling and has been highly praised for her thrilling live performances. Taylor will be accompanied by Karen McVicar on piano and accordion (PRS British composer award 2010) and by Rudi de Groote on cello (principal cellist Orchestra of Scottish Opera).